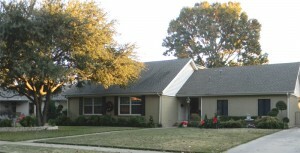 We are honored that you chose our yard for Yard of the Month! I’m not really sure exactly what all we have done, since this yard is a yard in progress and we do it by ourselves, it has taken us quite a while to get even this far. We have lived in this house for 18 years. When we purchased it, there were 5 of the biggest darn bushes I think I have ever seen. We removed the 2 on each end of the house and one that was actually trimmed like a tree. In front of the garage part because they hid most of our house. We painted the brick to give it a fresh look. There were 2 more of those huge bushes flanking the front porch, which we finally removed a few weeks ago. That really opened up the front of the house! I was totally floored at how much bigger the house looked. We did replant some smaller evergreens in their place, but I’m not sure we will leave them if they get bigger than I want. And last we put up a brick planter around the oak tree out in the yard. So that’s about it, our neighborhood has some of the prettiest homes and it’s hard to keep up with the “Jones”.